Tabacchi denotes a tobacco shop or tobacconist in Italian. A Tabacchi is a very important place for tourists to Italy. Why do you need a tobacco shop if you don't smoke? A Tabacchi is where you can go to buy local bus tickets ( bigletti). You can often buy bus tickets at a news vendor's kiosk as well or at a biglietteria near the starting point of buses, such as outside a train station. Many tabacchi shops carry phone cards (scheda telefonica), which are generally the cheapest way to phone outside the country of Italy, and you can recharge (add money to) your existing Italian phone card. You might also find postage stamps (francobolli) at a Tabacchi. A large Tabacchi shop often sells pens, stationery, watches, candy and jewelry as well. If you need to send a fax, you can usually do it at a Tabacchi. Some may have personal care items such as combs or toothbrushes so if you've forgotten yours, check in a Tabacchi shop. Tabacchi shops also sell lottery tickets (gioco del lotto) and you'll often see Italians stopping in to buy one. And yes, you can get cigarettes, lighters, and other tobacco products at a Tabacchi in Italy. Some tabacchi have a vending machine outside so you can buy cigarettes 24 hours a day. By the way, smoking indoors is prohibited everywhere in Italy. 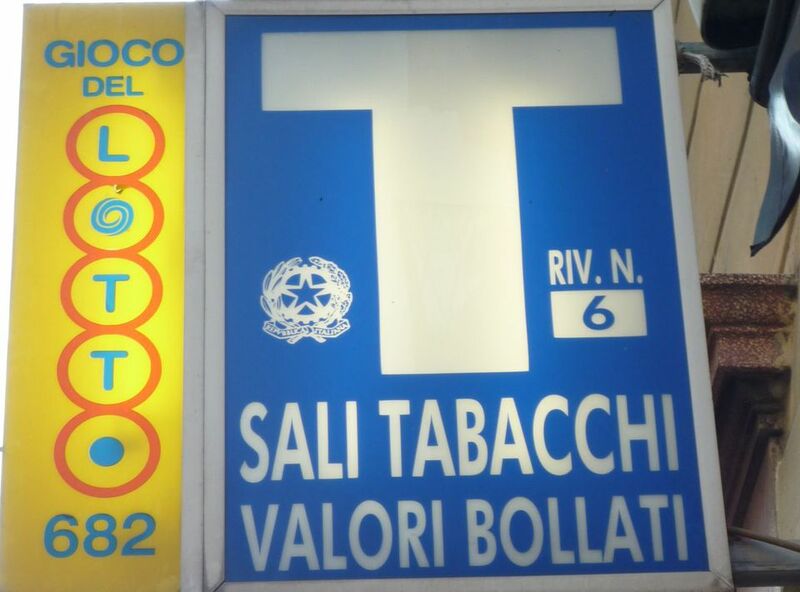 Tabacchi in Italy display the sign you see to the right, with a big white "T" on a dark blue or black background. Notice that the sign says "sali e tabacchi" which refers to two products that were controlled by the government, salt(s) and tobacco(s). While salt was once a government monopoly, it has recently been removed from government price controls. The signs have not changed, however. All tabacchi have to be licensed. In the past, a town's sali e tabacchi license was often given to a poor member of the community so that they could run the shop and earn some money. It was a form of social welfare. In some very small towns, a tabacchi shop may be part of a bar. Tabacchi can also be known as Tabacchino, or little tobacco shop.